What does a Lilac Point Siamese cat look like? And just what is so special about it? Learn more about the character and coloring of these very beautiful cats. Lilac Points are the 'artistes' of the Meezer world. Beautiful, theatrical and occasionally melodramatic, they seem to sense that they're somehow special and (even more than other members of the breed) like getting their own way. Lilac Points have Russian Blue cat lines in their genes, and you have to admit that, looking at the photo below, there is something of the Russian prima ballerina about them! Lilac Points are the palest of pale, with pinkish-toned, light 'frosty' grey ears, tail and paws (Lilacs are sometimes referred to, especially in the USA, as Frost Points). They are the lightest of the four major breed colors (Seal, Chocolate, Blue and Lilac). 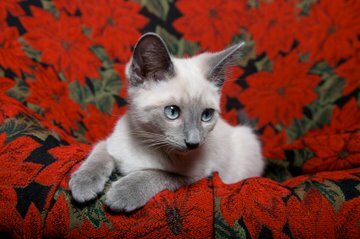 This color pattern is actually a paler version - what is known by breeders as a 'dilute' - of the Chocolate Point. Everything about a Lilac should be pale, from their eyes to their paws. Their eyes should be a pale, china blue. Their nose leather and paw pads have a pale pink undertone and they should have light cream or magnolia-colored (not pure white) coats, which stay pale throughout their lives. Many people get confused between the Lilac Point and the darker Blue Point, because both are blue-grey. The difference is that Lilac Points are silvery-grey, whereas Blue Points are a darker, slate-grey, as you can see in the photo below. 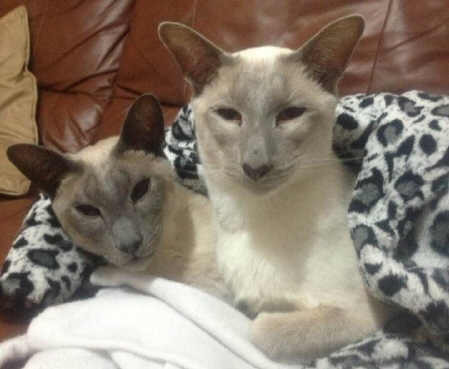 Mia, on the left is the Blue Point, and Gizmo, on the right, is the Lilac Point. The Lilac Point Siamese had a rather shaky start in life, because when cats of this color first appeared on show benches they were dismissed as poor quality Blue Points, even being called freaks by some people! However, they did eventually gain recognition as a color in their own right, first in the USA in 1955 and then in Britain in 1960.